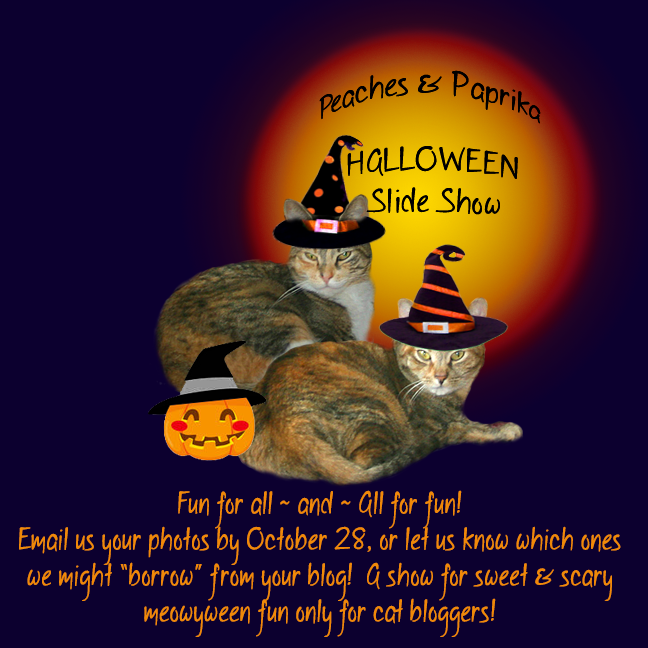 Dear Felines: Please participate in our Halloween Slideshow! Our dear friend Ann from the blog, Zoolatry (this year called "Boolatry") made this great graphic & turned Peaches & Paprika into witches for the occasion. Love it. 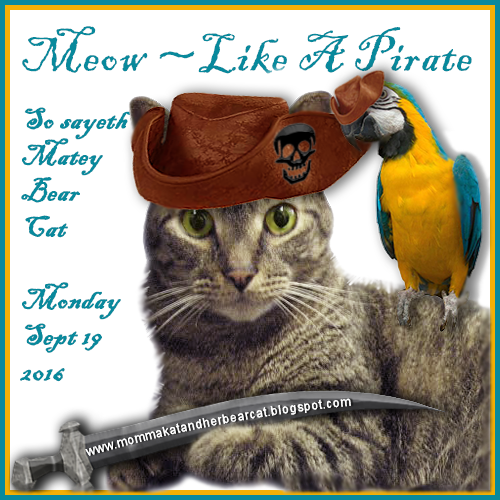 To be in the slideshow...Just post a blog link here or email carollowbeer@comcast.net with your Blog Link (can be from prior year) or graphic and YOUR furrrball(s) will be included just like Magic! 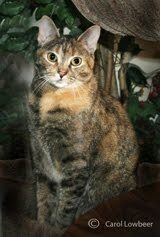 We are participating in Athena and Marie's Caturday Art and Cat on My Head's Sunday Blog to encourage YOUR participation! You two sure look good in your Halloween hats. Halloween is a fun time. Lots of scary stuff. Have a good day. And we love the Halloweballoon behind you! What cute art! Love the Halloween hats. You both make the loveliest witches. My mum is going to email my Halloween picture from a couple of years ago. What a fun way to celebrate! Thank you for hosting this. Thank you, we love the witch Athena! Cute graphic, we definitely want to participate. 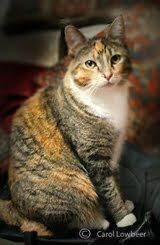 Mom wants to take some new photos of us but you can take anything from our blog. Ann (Zoolatry) did our header (Mom is NOT talented like that). I'll send you something to use. Love the graphic. FUN idea! Mom and I just sent you a photo of me in my costume from last year........!! Got them! Thank you CK. 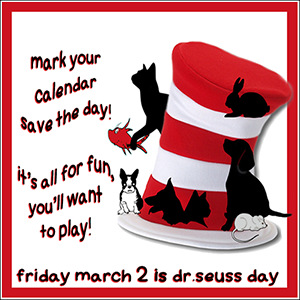 Yes, Ann of Zoolatry always makes such inventive graphics I am always awed! Got it, it's adorable, thank you Sammy! We're pretty sure we have a Halloween photo hanging around. We'll look for it. Wes would LOVES to pawticipate in your slide show!!! If yous wants any special graphics, lets us knows wes will does them for yous if we has the time! We would have fun joining in this event. Oh crepes I forgot OK I will work on a picture for you this week-end I hope this is OK sorry. Still time to join our Halloween slideshow! Which furrrball gets sprawling rights?